The first issue is related to the familiarity viewers have with the topic — is language used in the ads such as “Congratulations” or “Don’t Let Our Constitution Die” too esoteric, too “inside baseball”? (For example, “FISA” is not defined in the “Congratulations” ad.) If so, that may argue for a limited rollout of the current ads, and the development of a new, more easily understood educational message. The recent TV appearances of former NSA worker Russell Tice makes me wonder if it’s possible that our ads might inspire others like him to blow the whistle on the NSA warrantless surveillance program. If so, continued or perhaps specially rewritten ads in the DC area and other NSA locations might be worthwhile, wherever they are — e.g., Fort Gordon, GA (Augusta), Bridgeton, MO (ATT facility), etc. — if served by one of the media markets listed above. 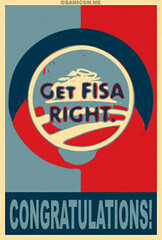 Get FISA Right conference call Wednesday: notes and download info here. – change.org Managing Editor Josh Levy, on the Blog for Change. change.org’s press event on Friday featured some great speakers and got some nice press, for example Diego Graglia’s Immigrant Students, DREAM Act Supporters Hoping Obama Will Take Up Their Cause on Feet in 2 worlds, Nancy Scola’s Ideas for Change Settles on a top 10 on techPresident (which has the vote totals for the top ten finishers), and Prerna’s Undocumented Students Raise Voices Online for DREAM Act in New American Media (a great description of how our allies the DREAM Activists approached the competition). Get FISA Right’s Thomas Nephew was there in-person and discussed it on newsrackblock.com in We’re Number 5! We’re Number 5! Yay us! And there’s a lot of ways we can build on this … discussion starts below. At this point, though, the top priority is to take a break, enjoy the Inauguration, and recharge yourself. At least in SF, where I’m spending the weekend and the weather’s beautiful, it seems like everybody’s got a spring in their step — and that should go double for Get FISA Right. Congratulations both to us, and to President Obama! So, please, take it easy for the next couple of days … I’m going to be doing that too, so other than a couple of blog posts, expect to hear a lot less from me. Macon Phillips, director of new media for the Obama transition team, thanked the group for its efforts. “A lot of people in the transition have been paying attention to Change.org and are very interested,” he said. You are currently browsing the Get FISA Right blog archives for January, 2009.